Alver Tait is an internationally renowned Nisga’a master carver. He is a leader in his community and an exemplary ambassador for the Nisga’a and British Columbia in international venues. 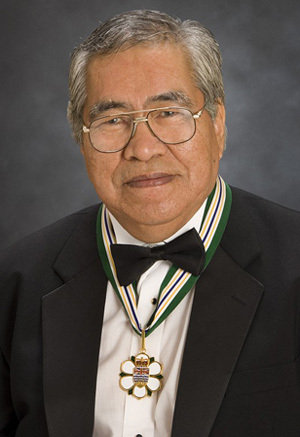 As a hereditary Chief of the Eagle-Beaver clan, he is extremely knowledgeable in the culture and traditions of his people and his tireless efforts to improve the welfare of his community have served to focus much attention on BC and the history of aboriginal peoples. Mr. Tait’s greatest contributions have come from his status as a master carver, illustrating the stories and legends of the Nisga’a people. He has produced many of the signature Totem Poles that adorn the Nass Valley in Northern BC. He assisted with the carving of two red cedar canoes in 1980, with his brother Norman Tait, who taught him the art and also worked with him on the Beaver Totem Pole that stands at the Field Museum in Chicago. In 2002, he was commissioned to carve a 12 meter Totem Pole for the 250th Anniversary of Vienna’s Schoenbrunn Tiergarten, the world’s oldest zoo. In recognition of his fine craftsmanship, Alver Tait was selected by the City of Vancouver to carve a Nisga’a Eagle bowl, which was later presented to Her Majesty, Queen Elizabeth II. He was recently asked by the British Museum in London to restore a totem pole carved in the 1860’s, which was originally a monument to his great-great grandfather, Luuya’as, carrying the Eagle-Beaver images of his clan crest.